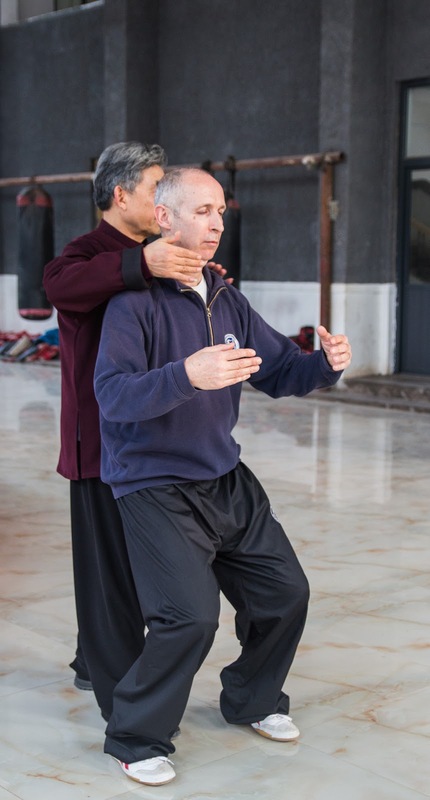 Talking Chen Taijiquan with David Gaffney: Chen Xiaoxing – “If you can see it, it is too much”! Chen Xiaoxing – “If you can see it, it is too much”! The experience of training in Chenjiagou has changed in many ways over the years. In the first place it’s impossible to ignore the backdrop of the speed and scale of changes taking place in China. Within this setting, the remarkable pace of development of Chenjiagou shows no sign of slowing down. The simple dusty village that captivated me in the 1990s, seeming to have stood still in time, has been replaced by a modern vision of what the birthplace of an art as famous as Taijiquan “should” look like. With stadiums, a modern exhibition centre, Taijiquan museum and numerous Taiji themed tourist attractions. In the centre of the village the Chenjiagou Taijiquan School has also grown larger over the years. The main training hall that used to be a Spartan concrete floored empty space is now fully equipped with modern training aids including a full sized boxing ring, rows of heavy bags and a raised push hands ring. That said, within the school there is still a palpable sense of tradition. A portrait of Chen Xiaoxing, the current principal of the school looks down from above the entrance to the room. The opposite wall is decorated by portraits (left) of his direct ancestors: his father Chen Zhaoxu; grandfather Chen Fake creator of the New Frame routines; another three generations back, Chen Changxin who reclassified the older forms of the system into the Laojia routines; back to Chen Wangting creator of Chen family Taijiquan. With all the changes, some things are refreshingly familiar. For instance the importance Chen Xiaoxing places on zhan zhuang (standing pole) as the primary means of realising and training Taijiquan’s jibengong (basic training). Taijiquan’s training methodology is built upon an implicit understanding of the ultimately limiting practice of building strength and fitness on top of dysfunction. At the most obvious level zhan zhuang helps to establish the required body shape - hips and shoulders level, crotch rounded, head upright and balanced, shoulders relaxed and elbows sunken etc… requirements quoted, but often not manifest to a sufficient degree. 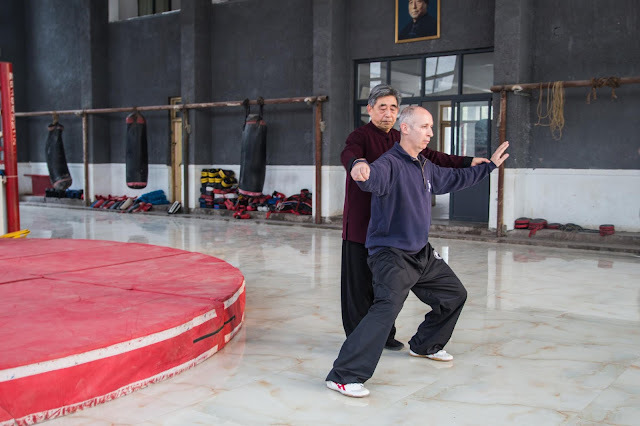 Beyond this zhan zhuang training provides a means of beginning to physically understand and manifest critical but far from obvious aspects of Taijiquan. Chen Xiaoxing jokes sometimes that the thing his students fear the most is standing. Where some people emphasise standing training as a relaxing meditative experience, with him it is also a physically and psychologically challenging practice. Training two sessions a day, every session begins with half an hour or so of zhan zhuang. During our recent visit a film crew spent several days shooting around the school and surrounding village. The German-New Zealand-China collaboration, documenting the many “Colours of China” had spent a year filming around the country. The German project manager was fascinated with the paradox of Taijiquan training - on the one hand the quietness of the practice, and on the other the intensity. The way that everyone in the room’s legs seemed to be shaking with the effort the instant they were adjusted and corrected by the teacher. During the visit we spent ten days working through and refining the Xinjia Yilu routine. If our motivation for training is functional efficiency, then a critical goal of training is the development of non-telegraphed movement. Where modern practitioners often talk about effective martial training, in reality practice is often geared more towards performance and demonstration. There’s nothing intrinsically wrong with this in terms of fitness and health, self-expression etc. But, in a real situation telegraphing your intention can lead to a disastrous outcome. Anyone who has taken part in competitions where there are real physical consequences for making mistakes realise quickly and painfully the importance of hiding what you are going to do. Chen Xiaoxing often repeats the phrase “if you can see it it is too much.” For example as a practitioner shifts weight from one side to the other, the intention is to move the waist in a narrow almost imperceptible arc. Just as not engaging the waist is a fault, over-turning is also an error. So we need to look beyond aesthetics and the desire to show everything.